Giant jellyfish (Echizen kurage) caused 101,540 cases of damage to fisheries between September and December 2005, including reduced catches and increased labor, according to research conducted by the Fisheries Agency. The results of the research were announced January 19 at a strategy meeting attended by officials from prefectural and city governments. The research was conducted by local governments over the four month period. Cases of reported damage were broken down as follows: increased labor/time -- 34%, reduced catches -- 23%, reduced seafood prices due to lower quality and freshness -- 22%, interruption/suspension of fishing operations -- 4%, and physical damage such as torn nets -- 4%. Damage to trawl nets and fixed nets was significant for some types of fishing. October saw the most damage, with 37,087 cases reported. The number of cases was determined based on each type of case that occurred per fishing vessel per day. Actual financial damages are difficult to calculate, so they remain unknown. Fiscal year 2005 has seen the largest numbers of giant jellyfish in recent history, and the increased numbers have affected fishing in the Japan Sea, as well as in the Pacific Ocean and Sea of Okhostk. The overall numbers are now declining, but the jellyfish are still showing up in large areas of the Japan Sea and on the Sanriku Coast, where they are expected to be seen through February. WOW!!! I didn't know they could get that big. This is amazing im going to tell all my friends abot this. That is a very large jellyfish. Is IT liable to kill you like the box jellyfish? Very scary how did you do it! woooo....huge jellyfish... be care full a..
dangggggg that jellyfish is big !!!!! i cant believe thats a jellyfish! wow!!!!! that is one ig jellyfish!!! Ihave to do a project on japan!!! Holy hell that's a big one! I've never seen a live jellyfish before, but i'd hate for that one to be my first. this jellyfish can kill people, it swallows you whole. its just as dangerous as a box jellyfish. why the hell would you go near that thing you would die in like less then 10 seconds! but that is one huge jellyfish. you'd be mad to go near that thing its got death written all over it, and its looks sick !!!!! 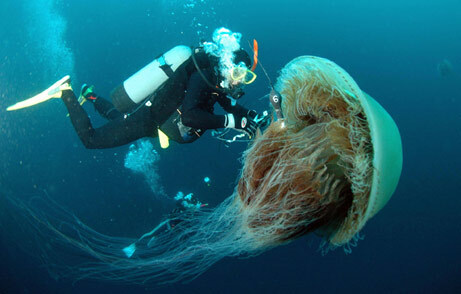 Damn!, that's a big jelly! Do jellyfish poop? This is not big at all compared to the one i saw in North Carolina!!! Incredibly what a shocking matter to work with,might that actually seem to be of use later in life Most probably this will be considered a lesson in learning. Never would have it occurred with this type of outstanding exposure of a wide range of the effects,most of the fishing may well vary but it's certainly not just about only one individual because mother nature set in full dominance. That is a lions mane jellyfish. Despite all these comments about it being deadly, the sting from these pups only cause localized redness and temporary pain. Virtually harmless.